This is the latest installment in a series called "K-Fails", in which Meg does something dumb because she can't speak Korean. Today's K-fail is an ongoing problem. As you may have gathered from a few posts back, I have recently acquired a new microwave. That does not, however, mean that I know how to use it. Yeah. I know. Google Translate's crippling weakness regarding the Korean language aside, I have no idea what any of these could possibly mean. Except thaw. That one's pretty self explanatory. 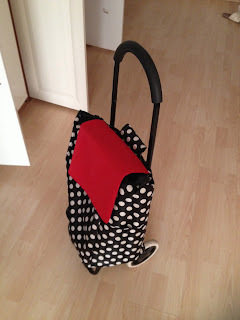 It took me several tries, but I eventually figured out that if I put it on "yakjung," it will more or less do the trick. I don't know if that is a low setting or if my microwave is just a pansy microwave, but it still takes a loooooong time to cook my mug cake. 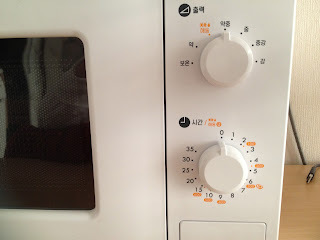 This K-Fail is still unresolved, so if any Korean speakers out there would like to chime in and demystify the enigmatic microwave, I would welcome you with open arms. For 4, the symbol on the right we've gotten to mean moderate/medium, so maybe 4 is medium low? And it shares the left symbol with 2, so that would make 2 low. Oh hahahahahaha. My mom refuses to use one of those still. . . and she is an ajuma. . .
Ohhh wow! HAHAA I love your ajumma cart!!!! I neeeeeeeeed one :) Where did you get it from? Homeplus! I highly recommend it. Definitely a worthwhile investment.